TGI Fridays provided a wonderful dinner solution for us sandwich generation folks. Caring for my dad has put a huge limit on the family dinner outings. With TGI Friday’s new “Entrées for One,” our entire family can enjoy TGI Friday’s food from the comfort of our home. I never imagined it would be so difficult to plan a simple dinner excursion. Good days and bad days, weather conditions, and other senior moments can nix a family dinner date in a moment! The variety of Entrées for One meals include something for everyone’s taste including Sizzling Chicken Fajitas, Sizzling Steak Fajitas, Grilled Chicken Mac & Cheese, Prime Rib Stroganoff, Chicken & Broccoli Alfredo, Loaded Chicken & Cheese, Cajun-Style Chicken Alfredo, Sesame Orange Chicken, Creamy Chicken Pasta Carbonara. Additionally, they eliminate running for take out too! Convenience at its finest would you not agree? Sampling the Steak Fajitas entrée, it was nearly identical to the restaurant’s quality and the portion was a typical amount to feed one person. I added sour cream, guacamole, and a spoon of salsa for a complete Steak Fajitas dinner. Outside of my favorite toppings, everything for a fajita dinner was included in the package. Best of all, the meals are microwaveable and ready to eat within minutes. I highly recommend trying out T.G.I. FRiDAY’S “Entrées for One”. The food is yummy, cooks up quickly, and everyone has a meal choice. Purchased on grocery day, they are the perfect substitution for those nixed family dinner outings! 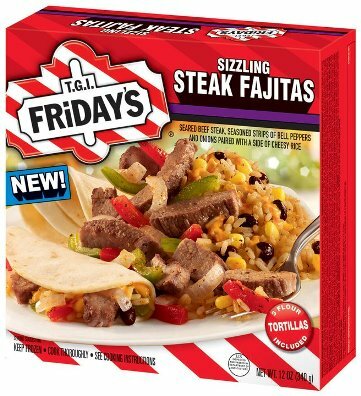 “It’s time to shake things up in the frozen food aisle and rethink the possibilities,” according to Michelle Fuscaldo, associate director for TGI Friday’s Frozen Foods. TGI Friday’s has a Fun Freezer contest going on to promote their new “Entrées for One. ” They invite you and me to join their Fun Freezer contest, where you can enter to win fabulous prizes, including a home theater makeover. Simply “Like” them on Facebook, enter, and share a picture of your Fun Freezer mealtime. Somebody has to win so check it out; you might be one of the lucky winners! Very interesting. As you wisely observe, TV dinners are a great help for those of us in the Sandwich Generation, busy juggling the multigenerational issues of caring for the elderly parents while raising kids or babysitting grandchildren. I have several favorites, but have never tried this brand, though I do love their restaurants. I’ll have to check them out. Thank you.